Am I ever glad that fall has arrived! I know that’s a little controversial, but hear me out. First – cooler weather. Maybe not such a big deal to you gestationally normal out there, but, for me as a pregnant lady, it’s huge. Second – food!!! We’re awash in peppers, pears, corn, tomatoes, grapes, even an early pumpkin or two. Third (or maybe second-and-a-half) – cooking is fun again. This one’s obviously linked to points One and Two, but there’s something about the changing seasons that reinvigorates me in the kitchen. So, whether or not you agree, hurray for fall!! The recipe below does not actually involve any seasonal produce, but it is tasty and certainly easy. I’m not usually a huge fan of chicken dishes. I generally find them a little blah and would rather spend my budget (financial and caloric) on more satisfying fare – like duck or eggplant. However, I was watching the Cooking Channel and caught this show about a woman who has a tiny restaurant in her Parisian kitchen. 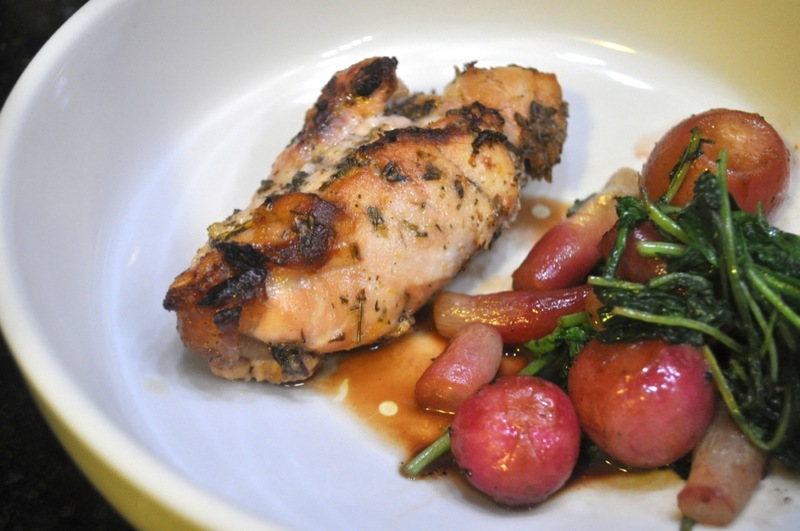 She made this lavender-lemon roasted chicken and made it seem so effortless and delicious. Maybe it was the British accent and perfect red lipstick…maybe it’s a weird pregnancy craving like the cucumber ice cream, but I opened up my Amazon app in a flash and ordered her cookbook . We’ve since made quite a few recipes out of this book and have been delighted each time. If you start with a cut-up chicken, it’s definitely a weeknight meal, but the complex tart-sweet-herbaceous flavor is truly dinner party worthy. Sorry for the lack of photos! Totally forgot. Combine all the ingredients except for the chicken and salt in a small bowl and whisk to blend. Arrange the chicken pieces in a container in a (mostly) single layer. Pour the marinade over the top and refrigerate for 30 minutes to 4 hours. Once the chicken has marinated, preheat the oven to 400 degrees. Dump the chicken and marinade into a baking dish and sprinkle with the salt. Bake (uncovered) for 45 minutes, flipping halfway through, or until the temperature at the thickest point is 165 degrees (or the juices run clear when you slice into the thickest part). This was so tasty, I’d lick my plate, but I don’t have my licker license. I love you and miss you already, Grandpa!